When it comes to shipping and distribution, the two terms don’t typically do go together. But some wine and spirit manufacturers are using distribution models that help achieve both goals. In a recent blog, we outlined 10 steps to streamline wine and spirits distribution. As a follow-up, let’s dive into two strategies that can be implemented in tandem: rail transportation and cross docking. If you haven’t considered using rail transportation in recent years, the term alone may conjure up nightmarish memories of slow service, indirect routes, and confusing contracts with multiple rail companies. These are now largely things of the past as the railroad industry has made enormous strides – and invested billions of dollars – in improving rail and intermodal service. Today, rail transportation is more efficient than ever as railroads work together to share lines, track containers, share boxes, and execute seamless solutions through a single contract. Rail was always cheaper, but today transit times are faster and much more predictable. In our paper, Look’s Who’s Riding the Rails, we noted rail transportation is about 3.5 times more fuel efficient than over-the-road trucking (OTR), and companies can reduce transportation costs by 15-20% by using rail service vs OTR (primarily through fuel savings). Rail also enables you to transport goods in greater volumes as shipping containers can be stacked. 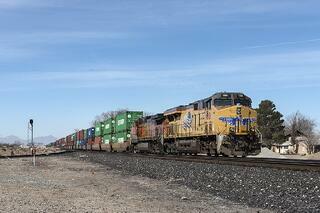 In fact, the average train can now haul 3,500 tons of freight – that’s 573 tons more capacity than just 16 years ago. Wine and spirits companies take great care to ensure that the fragile product reaches its destination safely and efficiently, so why use up time and resources to just have it sit in storage when you don’t need to? Cross docking services allow you to break down items at the receiving dock and match them with pending orders for immediate shipping and distribution. When the volume and timing of supply can be managed to precisely match demand, days are removed from the distribution cycle and huge reductions in inventory are possible. One major wine maker combines rail and cross docking to operate a very responsive, very lean cross-country supply chain. Product moves from California to the East Coast in box cars that arrive at KANE’s rail-sided warehouse. When it arrives, it is often cross-docked to waiting trailers for delivery to distributors. The transit times are so predictable that the company holds no more than two weeks of inventory at the warehouse and they have shrunk order cycle time for distributors from 2–3 weeks to 2 days. Fast and cheap may be an overstatement, but wine and spirits makers are certainly capitalizing on new and effective ways to streamline shipping and distribution. One way to fast-track desired changes in your supply chain is to engage with a 3PL experienced in logistics for beverages, including wine and spirits. They can share ideas on new strategies to consider based on their experience.